Who are these dancing ladies? College alumni who have gathered to commemorate old friendships? A group of happy mothers celebrating time away from their families? Or perhaps "young" divorcees looking for second marriages? No. Nothing of the kind. They are Catholic nuns, some of the 400 American nuns representing 115 Catholic Congregations of Religious Women who met in Chicago. From July 14-16, 2002, they gathered at Loyola University to discuss the catastrophic crisis of vocations their congregations are experiencing and to suggest solutions to the problem. The poor sisters don't realize that their progressivist ideas and worldly behavior - following the patterns of the Second Vatican Council - alienate true religious vocations and are the very cause of the crisis they seek to avoid. 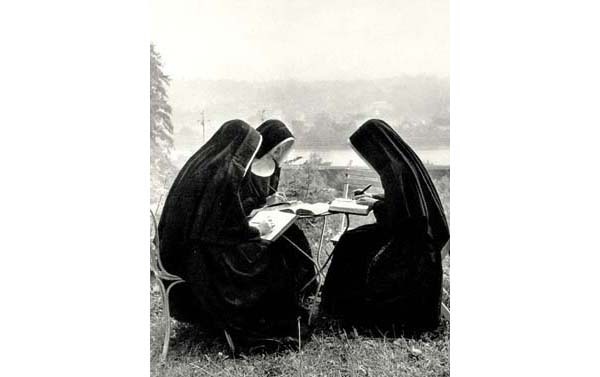 If they would return to the tradional teaching of the Church and the religious style of life they had before the conciliar novelties (below), they would find their convents filled with new and precious vocations.